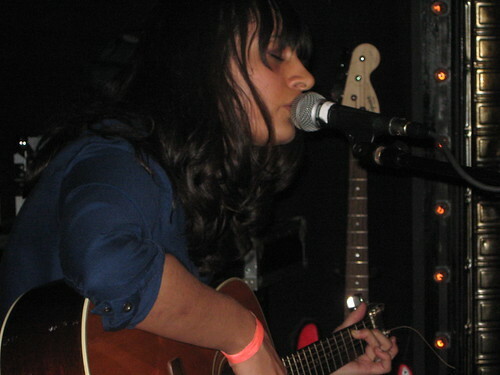 Natureboy is the musical project of singer-songwriter Sara Kermanshahi. Sara has been on our radar for about a year, so we decided to check her out at the Kevchino-produced show this past Saturday opening for nyctaper-favorite Sharon Van Etten at Union Pool. The live Natureboy is a trio, as Sara is backed by Cedar Apffel and Rory O’Connor (i.e. Masterface) on guitar, bass, drums, laptop and effects. The performance at Union Pool was truly a revelation. Sara’s voice is rich and throaty, and the tasty backing instrumentation perfectly highlights the entrancing songs. When Sara finished the set with a solo rendition of the obscure Dylan-via-Nico nugget “I’ll Keep it With Mine” we knew that this performer was truly in touch with her influences. The upstairs Union Pool soundboard was unable to yield a proper feed for this show, so we decided to run the four-microphone mix in the middle of the floor. While there was some room noise, minor hiss in the speakers, and chatter during the first minute of Sara’s set, the overall sound quality is quite excellent. Enjoy! If you email nyctaper for access to this recording, we expect that you will PLEASE SUPPORT Natureboy, visit their MySpace page, and purchase Sara’s self-released debut album by following the links to amazon.com mp3s and Itunes at the Natureboy MySpace page. Nice, thanks for the Nature Boy, only a few tracks in so far but it is very good! I recently became addicted to Natureboy – bought the album and the new issue of Esopus with her track “Ode to Merry Maid.” This live set is awesome and much appreciated! Thanks!! A very moving performer……see her live if you get the chance. I’ll Keep It With Mine was written by Bob Dylan, although Nico’s version is well known. Fairport Convention also recorded a great version of the song. I have listened to this album so often that I know the background noises by heart. I can feel when it’s almost time for the bartender to start shaking the drinks, when whoever asks whoever to please quiet down. This music saves me. Every time. Thank you. Thank you. Thank you.